Chopin, Kate. (1899, 2008). The Awakening. Premier Classic Paperback; New York. It is hard for me to fathom how this book was written and published so very long ago, although Knopf Publishing Group thoughtfully outlines a chronology of historical events to contextualize the work in my version. While reading the book, I had to keep telling myself – this was published in 1899! By a woman born in 1850! How truly, utterly, and absolutely extraordinary. 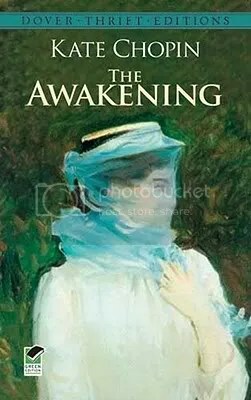 For you see, the content of this novel is incredibly progressive and the attitudes of the protagonist, Edna Pontellier, well beyond her time. It is today upheld as an important feminist text, though it was not well-received when originally published in the American South – in fact, it ended Kate Chopin’s writing career (Wikipedia article). “The golden shimmer of Edna’s satin gown spread in rich folds on either side of her. There was a soft fall of lace encircling her shoulders. It was the color of her skin, without the glow, the myriad living tints that one may sometimes discover in vibrant flesh. There was something in her attitude, in her whole appearance when she leaned her head against the high-backed chair and spread her arms, which suggested the regal woman, the one who rules, who looks on, who stands alone. But as she sat there amid her guests, she felt the old ennui overtaking her; the hopelessness which so often assailed her, which came upon her like an obsession, like something extraneous, independent of volition. It was something which announced itself; a chill breath that seemed to issue from some vast cavern wherein discords waited. There came over her the acute longing which always summoned into her spiritual vision the presence of the beloved one, overpowering her at once with a sense of the unattainable” (Chopin, pg. 169 – 170). I strongly recommend this book as an incredible psychological analysis and social critique of women’s attitudes and status over time. Even more incredible is the history of Kate Chopin herself – a writer who bordered on genius and a woman who had six children before she was 28 years of age (Wikipedia article). Although Kate wrote passionately about sexual liberation over 100 years ago, her reflections remain relevant and thought-provoking for the modern reader.